One of my mom's favorite desserts when I was growing up was cheesecake and time after time she would attempt to make one and well, let's just say she was really good at adding a distinctive carbon flavor to them. When Chris told me he wanted cheesecake I immediately thought of my mom and panicked. I was so nervous while making this cake! I measured everything I needed ahead of time and placed it into little bowls, Martha Stewart style. Luckily the cake was a success. So Mom, this one was for you! Preheat oven to 300F and toast the hazelnuts in a warm, dry frying pan for about 7 minutes. Transfer nuts to a food processor and pulverize. Add sugar and pulse a few times. Pour into a bowl and add vanilla wafer crumbs, chocolate chips, and butter. Mix together thoroughly. Press evenly onto the bottom of a 9 or 9 1/2 inch spring-form pan and gake for 15 minutes and then cool. Increase the oven temperature to 350F. While the crust is cooling, in a large bowl, beat the cream cheese until soft and fluffy, stopping from time to time to scrape down the sides of the bowl and mixers. Keep the mixer running and add the sugar until well combined. Add the eggs and liqueur, stopping every now and then to scrape down the sides. Mix until well blended. Fold the mini chocolate chips into the batter. Pour batter into the cooled crust. Gently drop the cheesecake on the counter 3-6 times to release trapped air-bubbles. Bake in the center of 350F oven for 1 hour, slowly turning it one-quarter turn every 15 minutes. After an hour, remove it from the oven and set it on the counter to cool. Run a knife around the pan's edge. Slowly remove the outer ring and let cool completely. Note: The cake will fall while it is cooling! Meanwhile, melt 1/2 cup chocolate chips in a double boiler. Once the chocolate is completely melted, add sour cream and mix well. Then add liqueur. Spread glaze on the top and sides top of the cooled cheesecake. In a small bowl, microwave the white chocolate for one minute on high heat, stir, then microwave again for 30 seconds. Transfer white chocolate to a zip lock bag and push contents to the corner. Snip a the corner of the bag with scissors. Slowly pipe 7-8 concentric circles until you reach the center of the cake. 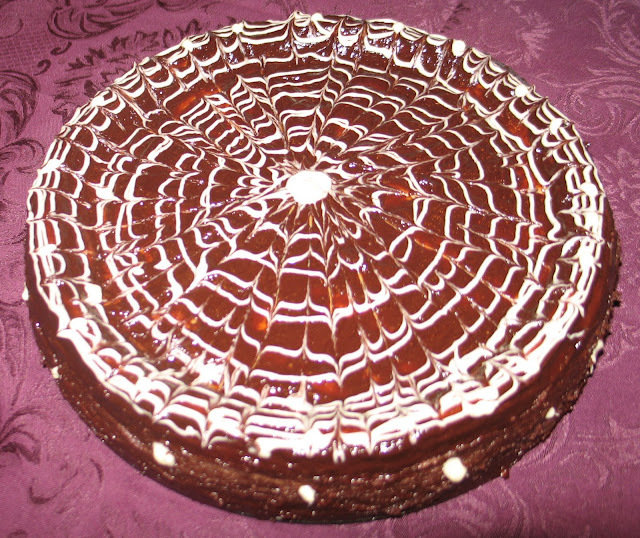 Using a toothpick and medium pressure, starting from the center of the cake, slowly drag the toothpick through the lines of the circles, dragging the chocolate along the way. Store in the refrigerator until ready to eat. That cheesecake was amazing! Dangerous, even. You are the Birthday Angel: the hazelnut cheesecase is heavenly. I am transported . .